The missiles targeted the Shayrat air base near Homs, and were in response to a Tuesday chemical weapons attack. Officially announcing the strike, President Donald Trump said the targeted airfield had launched the chemical attack on a rebel-held area, and he called on other nations to oppose Syria's embattled leader. "On Tuesday, Syrian dictator Bashar al-Assad launched a horrible chemical weapons attack on innocent civilians. Using a deadly nerve agent, Assad choked out the lives of helpless men, women and children. It was a slow and brutal death for so many. Even beautiful babies were cruelly murdered in this very barbaric attack," Trump said Thursday night. A U.S. defense official called the U.S. strike a "one-off," Reuters reported. Nine civilians including four children were killed, the Syrian state news agency claimed, but the Pentagon said civilians were not targeted. On Thursday, Secretary of State Rex Tillerson said Russia had failed to carry out a 2013 agreement to secure Syrian chemical weapons, adding that Moscow was either complicit or incompetent in its ability to uphold that deal. Tillerson said the U.S. had a high degree of confidence that sarin nerve gas had been used in Tuesday's chemical attack in northern Syria. The Pentagon released details on the strike, saying it was conducted using Tomahawk missiles launched from the destroyers USS Porter and USS Ross in the eastern Mediterranean. "A total of 59 (Tomahawk Land Attack Missiles) targeted aircraft, hardened aircraft shelters, petroleum and logistical storage, ammunition supply bunkers, air defense systems, and radars," Pentagon spokesman Capt. Jeff Davis said in a statement. "As always, the U.S. took extraordinary measures to avoid civilian casualties and to comply with the Law of Armed Conflict." 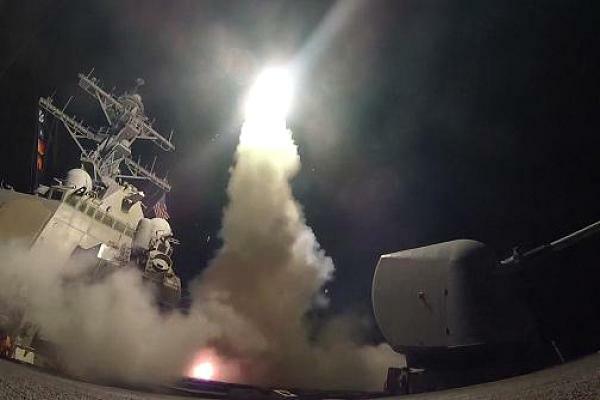 The Pentagon called the U.S. airstrikes a "proportional response to Assad's heinous act." No people were targeted, an official told NBC. Additionally, Russian forces were notified in advance of the strike, according to the Pentagon. "U.S. military planners took precautions to minimize risk to Russian or Syrian personnel located at the airfield," Davis said. Still, Tillerson said the U.S. "sought no approval from Moscow." Syrian armed rebels welcomed the strike. Ahrar al-Sham, an opposition group backed by Gulf states responded: "The armed opposition welcomes any U.S. intervention through surgical strikes that would deter the Assad regime capabilities to kill civilians and shorten the suffering of our people." Syrian state TV, meanwhile, said, "American aggression targets Syrian military targets with a number of missiles." President Donald Trump speaks at Mar-a-Lago in Palm Beach, Fla., Thursday, April 6, 2017, after the U.S. fired a barrage of cruise missiles into Syria Thursday night in retaliation for this week's gruesome chemical weapons attack against civilians. Earlier Thursday, Reuters reported that a British diplomat had said the United Nations Security Council would not vote Thursday on a draft resolution to condemn Tuesday's gas attack, but will continue negotiations. Russia's deputy U.N. envoy, Vladimir Safronkov, issued a warning ahead of the U.S. attack. "We have to think about negative consequences, negative consequences, and all the responsibility if military action occurred will be on shoulders of those who initiated such doubtful and tragic enterprise," Safronkov told reporters when asked about possible U.S. strikes, adding that such consequences could be seen in Iraq and Libya. The Russian response on Friday morning said the strikes violated international law and would do significant damage to relations between Russia and the U.S. The Russian news agency Interfax reported comments from the Kremlin which said the strikes had happened under a "far-fetched pretext." Kremlin spokesman Dmitry Peskov said that President Vladimir Putin believed the U.S. attacks on Syria showed aggression against a sovereign state. Western countries have blamed President Bashar Assad's armed forces for Tuesday's attack in the town of Khan Sheikhoun. Syria's government has denied responsibility. Republican U.S. Sen. Marco Rubio appeared to be tweeting about an American offensive action in Syria, posting at 8:44 p.m. ET, "'Be sure of this: The wicked will not go unpunished' Proverbs 11:21 #SyriaChemicalAttack"
The United States, Britain and France proposed a draft U.N. resolution on Tuesday to condemn the attack and press Syria to cooperate with international investigators. Russia said the text was unacceptable, and it proposed a rival draft. In February, Syrian ally Russia, backed by China, cast its seventh veto to protect Assad's government from council action, blocking a bid by Western powers to impose sanctions over accusations of chemical weapons attacks. China has vetoed six resolutions on Syria. A Security Council resolution needs nine votes in favor and no vetoes by the United States, Britain, France, Russia or China to pass.